Robert Pinsky is an acclaimed poet, translator, and essayist whom The New York Times has called “our finest living specimen of this sadly rare breed.” He has spoken of poetry as “one of the most fundamental pleasures a person can experience,” and as U.S. Poet Laureate from 1997-2000, he established the hugely successful Favorite Poem Project, in which Americans from a wide range of backgrounds shared their favorite poems, asserting the role of poetry in the lives of Americans. In this recording of the John Hersey Memorial Address from the 2010 Key West Literary Seminar, Pinsky reads some of his own favorite poems while musing about the process of remembering and forgetting in the context of modernist poetry. 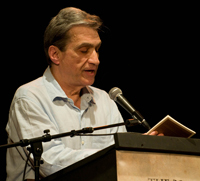 Pinsky discusses work by well-known poets including John Keats, Walter Savage Landor, Dante, William Carlos Williams, Ezra Pound, Allen Ginsberg, and Richard Wilbur. He also discusses an anonymous poem from the 18th century that was left with an infant at England’s Foundling Hospital; a visit he made to a Zulu Sangomo on a trip to Africa; and the work of psychoanalytic writer Hans Loewald. Pinsky’s opening remarks on Cuban patriot José Martí refer to the history of the San Carlos Institute, the venue where the lecture was given, and where Martí campaigned for Cuba’s independence from Spain. This recording is available for noncommercial and educational use only. All rights belong to the author. © 2010 Robert Pinsky. Used with permission from Robert Pinsky.